1) Choose a fabric that doesn't easily wrinkle. Holidays are filled with people snapping pictures, and you don't won't to be stuck forever remembered in a wrinkle covered frock. 2) Darker colors. If you are a little clumsy, like me, the holiday's can not be complete without you spilling something on yourself. Try wearing a darker color so that spills will not be as noticeable. 3) Solid colors. Solid colors photograph well. 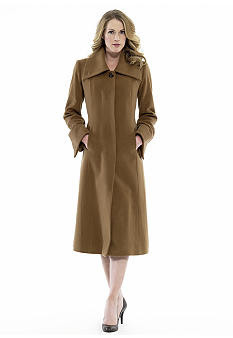 4) A sleek wool coat always looks great and also keeps you warm. 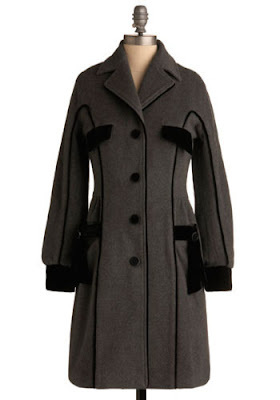 Many of you will be wearing "not-so-warm" dresses for the holiday festivities. Wear a longer wool coat to keep from freezing on your way to the party. 5) Updos. Frazzled in the way hair is never good. If you have long hair, try wearing it up. This will help keep your hair out of the way throughout the celebrations, and it will also keep it from getting frazzled during all the hugs from long seen relatives and friends. Father in heaven, we thank Thee!"